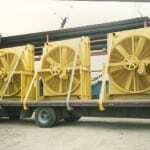 Industrial Radiators and Coolers for the Oilfield. 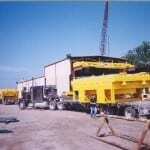 We are your one-stop resource for industrial radiator services, cooling towers (oil, gas, water), oil coolers (shell, air cooled, lube oil, tube, hydraulic), aftercoolers, intercoolers, watermakers and any other heat exchange services you might require. Restoration of a compressor cooler, the project scope consisted of retube, plugs, gaskets, electrical hook-up and motor testing. Structural modifications were fabricated, 2M replaced deteriorated side rails and guards, sandblasted and a 4-coat paint system was applied. Refurbished with new solder coated cores, bolts, gaskets, bearings, and pressure cap. The structural steel was rusted; 2M fabricated a new structure, sandblasted and applied a 3-part paint system. 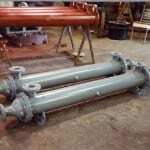 Water Jacket heat exchangers with steel shell and steel tubes fabricated, tested and painted at 2M. 2M replaced the tubes and the baffles using existing tube sheets on this particular job. Our capablities of refurbishing tubes sheets and baffles are endless. 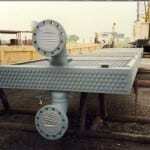 Call us for your U-tube heat exchanger requirements. 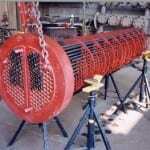 A restored fin fan gas cooler section ready for shipment. The project scope consisted of re-tube, new access plugs and gaskets, with structural modification of braces and side rails. The unit was hydro-tested, charted, sandblasted and a 3-coat paint system was applied. 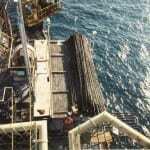 40′ tubes being installed by 2M’s crew on an offshore 5-stage compressor cooler (1st, 2nd, 3rd gas, 4th water and 5th oil).